Anyway, what I wanted to say before telling you why Heroes of Might and Magic is the best video game series ever created is: I got a job. Over the past few months, I’ve been working at a newspaper called Nikkei Voice. It’s a Japanese-Canadian newspaper that’s been around since 1987, and I’m heading it up as Managing Editor. It’s been a great learning experience and working with my coworkers has been both rewarding and enlightening. We even have a few articles about video games on the site too! At the paper we have three Japanese-language students who work with us and it’s been great to learn about the video game culture in Japan, but that’s a story for another day. Heroes of Might and Magic rules your face. Before I get into the game itself, I think a little background is necessary to understand why it’s such a big deal. Back when I was younger and megabytes of RAM was impressive, Heroes came into my life like a bullet train. It was basically the only game we had to play on our computer that was both riveting and deep. My brothers and I started off playing Heroes of Might and Magic II, but eventually moved up to Heroes of Might and Magic III. This is, unfortunately, where all of the good things I have to say about the series comes to an end, but the effect the games have had on me are still visible to this day. Heroes of Might and Magic has content in spades. It has a universe – Erathia and its surrounding provinces – filled with good/evil, light/dark, morality/ambiguity, and other similar themes playing into it. There was a story, it had characters, and it had everything my younger, more innocent self loved. It has everything that could make a video game great. What is also had was a memorable quality to the experience, which is something ineffable that’s missing from modern video games. What really did that for me as a kid were the heroes themselves. Look at that guy! Just look at how goddamn awesome he is. 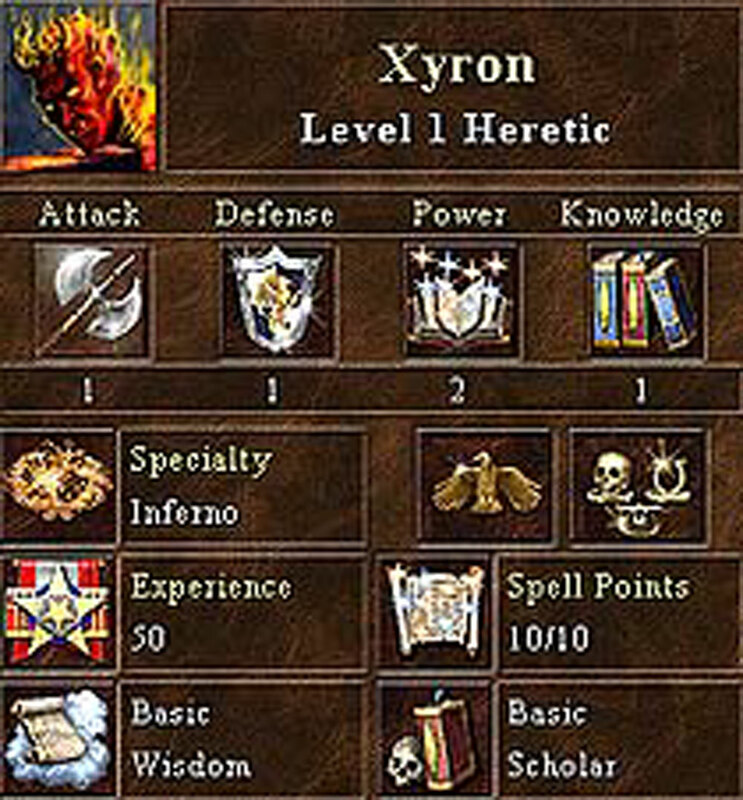 Xyron was my favourite character in all of Heroes of Might and Magic III. It’s not that he’s able to use the spell Inferno right off the bat, but that’s he’s an efreet made entirely of fire. Ifrit (which can be spelled many other ways) are cunning spirits taken right from Islamic folklore and they’re high up in the chain within the Inferno town of the Heroes of Might and Magic games. Apart from wondering how Xyron is manage to ride a horse while made of fire, just look at him! It’s hard to explain something like this when you look at something fantastical in a video game and it just works. It’s part making the player use his or her imagination to help flush out the characters within, but also that it gives you no way to imprint yourself onto them. Fantasy and video games have a strong relationship, but this bond is almost pure in the Heroes universe. While Xyron is inherently cool, so too are his surroundings and fellow heroes. All of the other heroes from the Interno Town are equally as expressive and impressive, and so too are the towns and the structures that make them so fantastical. For instance, the game the Holy Grail artifact is actually the Holy Grail. This enchanted item when found allows any player to create a legendary-level structure in any town that immediately increases its economic and military strength. It gave something players to compete over during the multiplayer matches and gave you an inventive structure that meshed with the fantasy-environments of each town. A shot of the Warlock Castle from Heroes of Might and Magic II. There are other characters like Sandro and Zam who are big players in the game’s image. What they represent is the kind of variety that gives players a sense of wonder. Sandro is a lich in the game’s world, but he’s also a character who plays a role in the game’s overarching story. Each character in one way or another plays into the game even if they’re just in a bit part. With each expansion pack and each additional campaign, the game built itself up from a pack of core stories into something much larger and much more challenging than before. It’s a game I still appreciate to this day for bringing me into a world filled with magic, fantasy, and heroes. I also have a bit of a love affair with the game’s creators and the cheat codes they included in each edition of the game. They change from being Monty Python’s The Holy Grail Themed to being Matrix Themed and Star Wars Themed. It was fun. Anyway, just a short article to get back into the swing of things. I’ll be trying to write here more often now that I have a little bit more time to spare. What I will say today is this: Have conversations about games. Instead of just reading the article above, tell me what you think! I’m always online to help provide some comments and discuss your thoughts on the experience. The best way to learn is to be active and I still have a lot of learning to do. This entry was posted in Gaming, Science Fiction & Fantasy and tagged chicken fingers, Heroes of Might and Magic III, nostalgia, PC games, video games. Bookmark the permalink. What the heck is ReBoot going to look like?